FAQ: How do I free up space on my iPhone? The name of the new operating system for Mac desktops and portables will be “Sierra,” but the notable change is the word in front of the mountain. A few years ago, Apple dropped the “Mac” from “Mac OS X” and the operating system was then “OS X.” Now, the “X” is dropped, bringing the nomenclature in-line with the other product names. 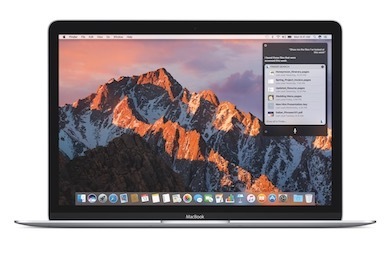 Check out Macworld.com’s macOS Sierra FAQ. Lots of improvements and new features, including enhanced messaging, photos, voicemail transcription, just to name a few. Checkout this slideshow from Macworld.com. Yes the Apple watch has it’s own operating system. The latest version includes more customization, an dthe ability to be “tetherless,” meaning it can connect to open Wi-Fi networks without needing to connect to your iPhone first. Check out Techradar’s Apple Watch OS 2: everything you need to know. That little AppleTV box is pretty smart, and about to get smarter, with Siri voice commands, just like your iPhone and iPad, single sign-in for all your video streaming accounts (similar to Keychains in macOS), and apps! Check out iMore.com’s tvOS first look: Taking AppleTV to the next level. Among the many other points on the WWDC agenda, the upgrades to Apple’s HomeKit API caught our eye, promising exciting things in home automation and security. Not only will AppleTV have control of HomeKit enabled devices, but also video camera support has been added. All HomeKit devices will be controlled thru a new Home app. Check out this story from CNET: New connected cameras will help Apple expand its reach in the smart home's door.